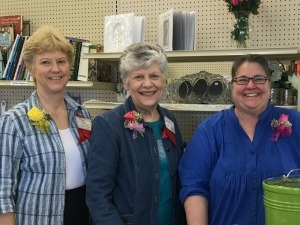 The Treasure Haus is a faith-based, non-profit resale shop in New Ulm, MN. Our merchandise consists of good-to-excellent used clothing, housewares, furniture, toys, books, jewelry, sports equipment, linens and much more. We rely on thoughtful people who donate their usable items to the Treasure Haus, which are sorted, cleaned and priced for resale by our dedicated volunteers and three managers. The mission of the Treasure Haus is to resell good quality, donated items to raise money for Minnesota Valley Lutheran High School (MVL) and other WELS and ELS ministries, missions and projects. As brothers and sisters in Christ we shall strive to carry out this mission in a friendly atmosphere with caring and respect for our customers and volunteers and for the good of our community and environment. The Treasure Haus was established in 1985 to benefit Minnesota Valley Lutheran High School. As God continued to bless us, our business grew and we are now able to not only support MVL High School, but other WELS and ELS ministries and organizations as well. Here is the list of projects which were considered by our voting members at the Annual Meeting of the Treasure Haus, Inc. These organizations are eligible to receive funding from the Treasure Haus as the proceeds allow in 2016. You may click on the links to learn more about these worthwhile ministries. Together, they manage the store sales, the intake and outflow of donated items, as well as the daily operations of the store. They schedule volunteer crews and are always on hand to assist them with all aspects of their duties.